This is the second book that I've been the technical book reviewer for, the first being Learn Raspberry Pi with Linux. When I was contacted by Apress to ask if I'd do the review then I didn't hesitate to say yes as from the description this sounded like just the sort of book I would be interested in. It did turn out to be the sort of book that I hoped it would be. 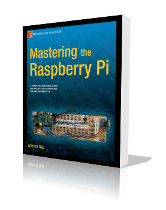 Mastering the Raspberry Pi is a book that delves into the inner working of the Raspberry Pi and combines electronics and programming using the Raspberry Pi GPIO port. The projects mainly use inexpensive electronics modules or components and provides the code required to get them working. To give a few examples it includes a real time clock add-on which ensures that the Raspberry Pi can keep time without needing a network connection, a Wii Nunchuck controller which provides an alternative controller to using a mouse and details of how to use the GPIO ports to control devices such as stepper motors. It has got quite a bit of theory, but also uses fun and interesting projects to make this a practical book as well as a useful reference. It's important to know that unlike many of the other books for the Raspberry Pi this is not a beginners guide for those new to programming. This is not designed for children, although would be suitable for those studying computer science at further / higher education or for someone that has already gained a good understanding of programming. You don't need much experience with electronics as it mainly uses pre-built modules or very simple circuits, but some programming experience is essential and preferably some experience in programming in C. This would be a good book for someone that already has experience with higher level programming that wants to learn more about how drivers are written and how to get down to the raw code that communicates with peripherals. It won't go as far as teaching you to be a kernel hacker, although it does provide information on cross-compiling your own kernel and it's certainly a step in the right direction if that is something that interests you. It also provides a good technical reference to the working of the Raspberry Pi, it's built in hardware and the GPIO ports. Whilst most of that information is already available from public sources it would take a lot of research to find out the information contained in the book. This can therefore be a big time saver. The one negative comment I have about the book is that it is aimed at the Model A and Model B Raspberry Pi, but there is now a model B+. This is not the fault of the author at all, as the book was just being published as the B+ was announced. The programming doesn't change much except for the availability of more ports, but it does mean that there are some ports on the B+ that would need to be researched by the user. This is only going to be an issue for a few users and it still gives the basic information that is needed when researching the additional ports, so after following this book you should know enough to find the rest yourself. This is not a book for complete beginners, but if you've already done a bit of programming and want to go to the next level then could be a good fit. It's also going to be useful for someone working with electronics hardware for the GPIO that wants to program directly with the GPIO rather than using the standard libraries.